The Live API examples are presented as a series of Live Sets. The sets provide content and specific configurations that show off the Live API, so we advise opening the sets before trying the example devices in your own set. The example devices are fully functional but in some cases require specific hardware or Live document configurations before they will do anything. 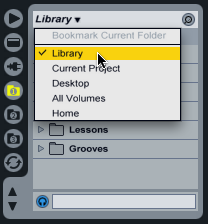 Click on the a File brower button in Live's File browser and choose Library from the pull-down Bookmarks menu to show the Library. Click on the arrow to the left of the folder marked Lessons to show The lesson materials. 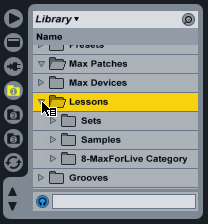 Click on the arrow to the left of the folder marked Setsto show the Max for Live Lessons sets. Each lesson will be displayed as a session document. To load a tutorial, double-click on a Live session document. 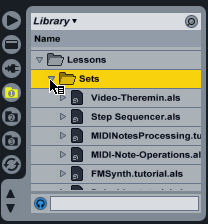 The Live API tutorials are Apple Remote, Clip-Operations, CS Step Sequencer, MIDI-Note-Operations, and Video-Theremin.